In late 2014 a brand new design for Celta Vigo’s aging Balaidos was presented for the first time. Same location, partly even the same structure (mostly north and south stands), but with brand new end zones and entirely redesigned roof. And not just any roof. The concept by local architect Pedro de la Puente Crespo, dubbed the “New Wave”, foresees a more uniform appearance for the entire stadium and leveled roof height. The lightweight steel roof is shaped to form waves, bringing to mind the maritime traditions of Vigo. And creating the stadium’s new identity despite moderate expense. 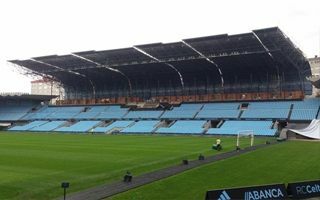 Works are phased not to force Celta out of the stadium during the season, even in the short term. However, this caused some headache regarding time frame, especially with Celta qualifying for Europa League group stage in 2016/17. Works actually began in early 2015 with the demolition of north stand’s lower tier. New one was created by May 2015, moved much closer to the field and with new facilities underneath. After the 2015/16 season dismantling of the old roof began. The concrete ‘gondolas’ hanging above fans were one by one taken down and crushed to rubble on site. Meanwhile, behind other parts of the stand, steel frames were being created. By mid-October of this year all of the roof was already hovering above the north side, lifted by a mobile crane. Currently overall roof works are beyond 70% and should be complete in December. One major thing missing, crucial to the stadium’s aesthetics, is the outer cladding of aluminum panels. These thin, flexible sheets will cover 3,500 m2 throughout the roof and façade. As the new roof is placed well above the former one, additional space for skyboxes was created on top of the upper north stand. While these are not in use yet, fans can already enter the stand and the space-frame-roof by LANIK engineers has new floodlights installed as old masts will soon be retired. Further works will include almost entirely reconstructed east and west ends, both moved much closer to the field to make Balaidos a true rectangular stadium. The south side is expected to be the last one awaiting reconstruction. Deadline for the entire project doesn’t seem solid at this point, however. Initially Novo Balaidos was scheduled for completion for the 2017/18 season, but now it’s more likely to end in 2018/19. Initial budget of the project was estimated to be under €30 million, but with delays and cost increase it seems unlikely for the project to stay within the estimate.